The camera catches The Ugly, The Grotesque, The Corrupt, The Petty, The Vengeful: the “maverick,” the “hero” we’ll remember. There was a collective gasp from even his most loyal supporters when President Donald Trump commented that even John McCain’s well-documented heroism in Vietnam was nothing particularly admirable. Hard to accept at first, but what has played out between those two opposing personalities is the ongoing drama of our political lives: the life-and-death struggle of a free, capitalist America fighting back against the relentless march of socialism, collectivism, communism. There are entrusted leaders who keep their promises, and there are those who blatantly betray that trust. 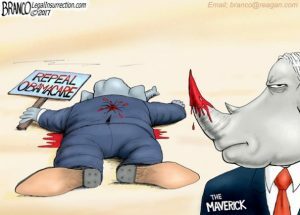 Thumbs down to ObamaCare repeal; knife in the back to his chosen Party, free market principles and the American people. Approaching death, John McCain proved to be the traitor to his country that he was not 50 years earlier in Vietnam. He could weather the torture and permanent physical disfigurement of Vietcong atrocities on his body, but standing on painless principle between the country he professed to love and Obama’s sinister “transformation” was beyond him. In the end, “The Maverick” was no such thing, just a petty politician, a career opportunist who will be remembered for selling out the American people and political party he exploited. As good a barometer as any of McCain’s real priorities is the lionization he now enjoys in death among the likes of the fashionably Leftist ladies of The View (including his silly, hapless daughter Meghan). 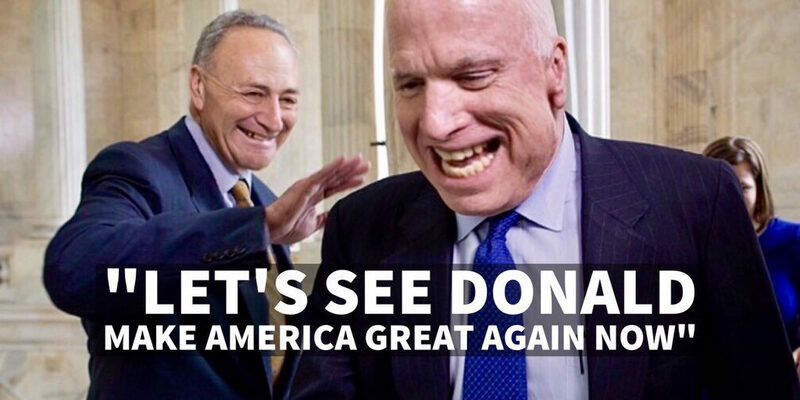 Already profiled here as the most RINO of notable RINOS, McCain merits his own special place in the M-A Hall of Shame. Here’s yet one more arrogant fool who put his stock in being admired by people who really despised him in life and now exploit his embroidered legend in death. The Saboteur: a lame legacy of revenge.